Make Scrapbooks, NOT dinner. : Tell me to go clean!!! I have to get away from here and get my house cleaned. My crop is tomorrow night and I have to get everything cleaned and then set up all the tables and chairs. I think we are really going to have a good turnout. Hopefully no one changes their mind. I'm really excited about it. I don't have much to say today. Just that I am so enjoying everyone's blogs. Keep up the great work! 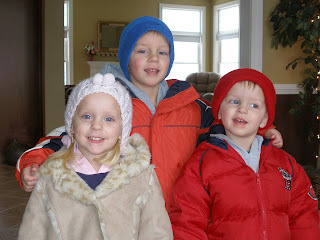 Here is a pic I took of the kids. It is awfully cold here. The high on Tuesday was 13 and the high on Sunday is 11. Brrrrr!! Brenda - get started again. It is so fun. I'm sure that you need something fun to add to your life!! 8-) Really, I do know that life gets a little busy. When we were building and after my surgery I took months off. I'm glad to be back at it. Thanks so much for stopping by!! Julie, Thanks so much for starting a blog. I love seeing all the pics!!! I would be happy to make you a planner. Just let me know. Leanna, I'm so glad I could help you come to that decision!! 8-) I'm glad you have a blog, too! Love seeing all the pics and you do a great job with it. What a cute picture! They are all just darling. By the way, I like the way you think! Jada and Bryce would be the perfect couple!